After that he made Formula One Grand Prix/World Circuit. The game was amazing! We had never seen game like that. was released in 1991 for Amiga, and after a little time for PC. PC version was even better! Game runs fine with 386 and when you have 486 graphics are suberb. 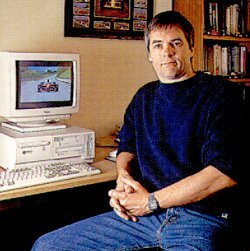 amazing 3-D graphics engine and computers cars can think. This was the biggest improvement compared with F1GP/WC.